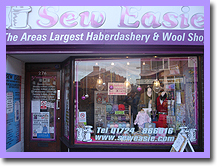 Established in 1991 and based on Ashby High Street, Scunthorpe, Sew Easie has been a leading supplier of fabrics, knitting yarns, haberdashery and card making products to Ashby, Scunthorpe and the whole of North Lincolnshire. We now offer a customised embroidery service specialising in school uniform, workwear and promotional clothing. We can also provide commission embroidery for any requirement - if you can get a needle through it, we can embroider it! Our embroidery is done in house by experienced staff, which gives us total control over the process ands your order, enabling us to give you the customer service you expect. We also offer a clothing and curtain alterations service. Simply bring your garments or curtains to our shop and let us know what alterations you require - our service is simple, fast and competitive. Sew Easie's range of stock is constantly increasing to include ever more exciting and interesting items and a recent expansion has seen the second floor of their current premises converted into an extension to house their huge range of fabrics. 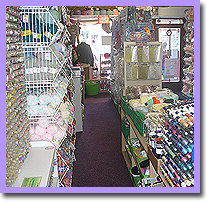 Alongside such traditional knitting and haberdashery products as yarns, baby wool, buttons, elastic, pins and their extensive range of fabrics, Sew Easie also stock more unusual items including card-making accessories, 3D stickers, punches, paper and flowers. They stock King Cole and Sirdar kintting yarns and have a large selection of knitting patterns. In the unlikely event that they do not have the wool you require in stock, it can be quickly and easily ordered from their suppliers. Among their equally comprehensive range of sewing patterns, there are offerings from Simplicity, New Look and Burda. Christmas stock is always available!